Tabanids were collected in an area in northern Germany, where pastured cattle were abundant. Trypanosomatidae were identified in 14% of tabanids examined. Twelve cattle became infected with Trypanosoma theileri after applying usually 2–5 infected tabanids, to the intact oral mucosa. Haematopota pluvialis, Haematopota italica, Hybomitra micans and Tabanus bromius were identified as vectors. 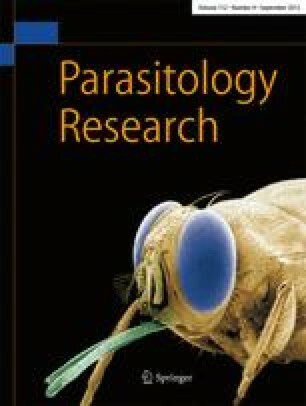 Infective stages of Trypanosoma theileri were identified in the gut and in the faeces of tabanids by transmission experiments. The minimum prepatent period was less than 4 days. No apparent signs of disease were observed in the infected cattle.